CA CPT Admit Card 2017 (सीए सीपीटी प्रवेश पत्र): The Institute of Chartered Accountant of India is going to conduct Chartered Accountant Common Proficiency Test on 18th June 2017. The aspirants are informed that they can download their CA CPT Hall Ticket from 25th May. The link for the downloading of the admit card is given below. The students will be able to get information about their centre of the exam. They are required to bring their CA CPT Call Letter on the day of Examination. The aspirants who have successfully applied for the CA CPT exam they can now download their ICAI CPT Admit Card. The aspirants will be allowed only with their admit card. They are also required to bring their photo identity for proof. The ICAI conducts this exam twice in a year. the students can check roll number from ICAI CPT Hall Ticket. They are required to follow some steps for the downloading of their admit card. 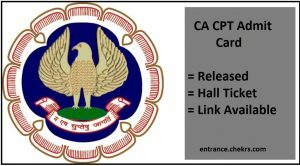 How to Download CA CPT Admit Card 2017. Then they have to open the admit card link from the notification panel. Now enter valid name and date of birth. Download the admit card in pdf file. Take a print out of the admit card for examination purpose. The Institute of Chartered Accountant of India will announce the ICAI CPT Result June 2017 in the month of August. According to previous year data, it is expected that the results will be announced din the second week of August. The students have done a lot of hard work for their preparations. They can check their CA CPT Result here after the official announcement. For feedback and more queries regarding ICAI CA CPT June 2017 Admit Card, you can contact us by commenting in the comment section given below.